Welcome to I/0 Electricians, your fast and friendly 24 hour electrical engineers in London! Operating within the domestic, retail (Shops,shopping centers,store outlets), commercial, and industrial Sectors, our london electricians cover electrical repairs, maintenance, testing and electrical wiring services. 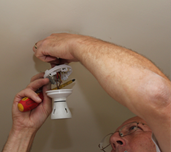 Our rates are very competitive compared with qualified and registered electricians. Never risk your safety by allowing an unqualified person to work on your electrics, no matter how low a price they may offer. To become an electrician it takes a great degree of dedication and skill. Every one of our electricians in London is put through a stringent screening process. We provide free quotes and estimates for any type of electrical work, however large or small that job may be. We have london electrical engineers covering, south east london, south west london, west london, north london and north east london and are available 24 hours a day, 365 days a year.